That Sunday morning was unusually crowded. The bus dropping the passengers at the bus shelter and cars lining up entering the nearest parking lot to Gelora Bung Karno. While not far in at the gate 4, people were waiting for their turn to show their beautiful and colourful traditional costumes to the audience that had been standing by with their camera on hand ready to capture the moment. That situation was none other but the Festival Pesona Lokal, a joint CSR program by Adira Finance, Ministry of Tourism (Pesona Indonesia) and also iNews. After held in 8 different cities around Indonesia for the last 3 months, it finally reached the peak of the programme in Jakarta which is also the last stop and closure of the whole festival. The event started from 7 am to 3 pm, attended by more than 10,000 participants from Adira Finance family, the local community, students, as well as the public. 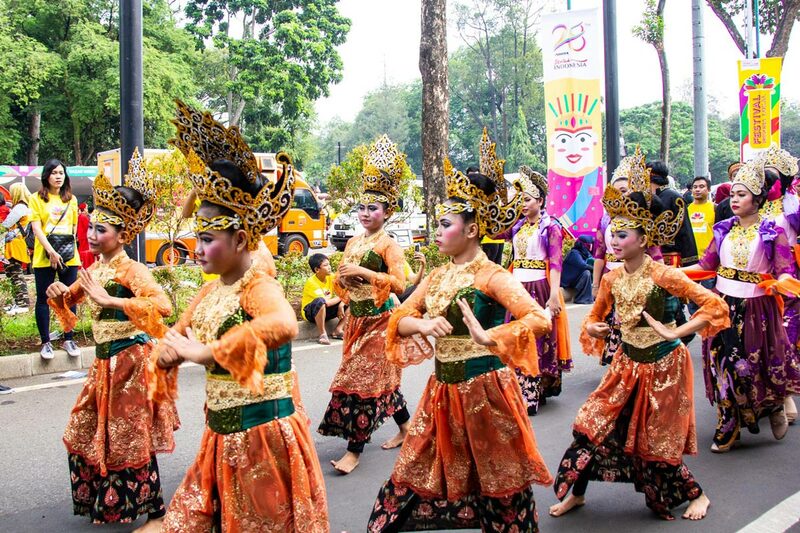 Festival Pesona Lokal Jakarta brought up the local culture of Betawi. We could see the Ondel Ondel Betawi, the large puppet figure featured in Betawi folk performance of Jakarta, and also few public figures that strongly related to Betawi cultures such as Riidwan Saidi and JJ Rizal. I was there around 7.10 am and the crowds were already there much earlier than me. Young and old, those who came with family or friends, they all gathered around the area where the costumes carnival parade would start from. More than 10,000 people taking part in the parade and activities. The march started from the Gelora Bung Karno headed to Sudirman and then ended at Gelora Bung Karno again, covered around 3,8 km in the total distance. Besides the cultural carnival, there was also mural art and local cuisine creation competitions. We could also see the sales booths from the local Micro, Small, Medium Enterprises (UMKM) and performances by the local talents that got the audience uplifted. Festival Pesona Lokal is indeed a good opportunity to gather people and see and show what skills the locals actually have. It’s been a while I didn’t see something artsy like mural arts. Seeing live how the participants standing for hours to create the mural arts under the hot sun made me appreciate their works even more. It was later when we were about to leave the venue, we noticed there was one participant that getting heat stroke and resting at the side under the medical team care. I believe they all tried all their best in their competition to win the attractive prizes. Sahabat Lokal, the CSR program by Adira Finance, is one of the company’s efforts in supporting the local talents and tourism. And to attract the younger generation to participate, they held photos and videos competition with the “Local Experience” as the main topic. The winner list had been announced at the 28th Anniversary of Adira Finance event. That moment was exciting, especially for all the winners as they prizes are more than 100 million Rupiah in total. Adira Finance not only concerns about tourism and the improvement of the local business in Indonesia but they also take part in improving the education hand in hand with the Ministry of Education and Cultural giving out a number of scholarships to the students in Indonesia. At the age of 28, Adira Finance hopes that they can keep on contributing to society, creating a sustainability impact through their innovation and services. Looking at what Adira Finance did – taking part in supporting the local talents, tourism, and in many areas, I am reminded of what I wish I would do as well when I have my own business or company as well one day. It is the time where we have had enough of saying or asking for a better life, living in a better society and start doing what we can instead to realize what we have been looking for. Complaining will not bring us any further. We might not have the ability to do in a such big scale but a simple act such as taking part in promoting the local tourism, support local products, care of the environment are just a few ways that we can do to improve the society where we are living in. If we don’t care, who will? Previous articleBunaken & Lembeh: Which One Shall I Go?